Madigan made… an #Ilovethrifting recap. How did YOU stay cool this past weekend? Well, I did my best to stay inside and in air conditioning. And… I also did my best to score some frugal finds for our home! What was I doing? Celebrating National Thrifting Day (a.k.a. I Love Thrifting Day), of course! I Love Thrifting Day is a movement that was started by Rashon Carraway (aka. Mr. 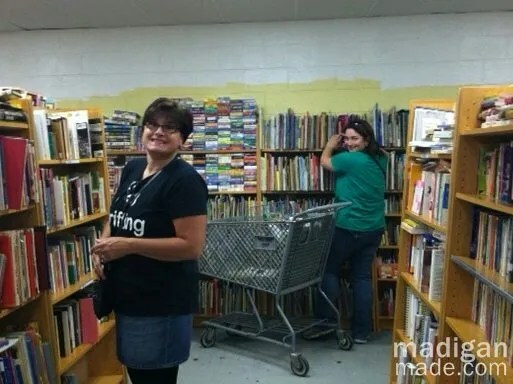 Goodwill Hunting) to encourage people to get together and shop local thrift stores. So, this past Saturday I met up with Diane (In My Own Style), Janis (The Magic That is Thrift) and reader Tracey for a day of serious shopping. The four of us went to three different thrift stores, ate lunch, had fun and tried our best to stay cool! Here we are with our treasures after the first store, 2nd Avenue Value Store. Then, we stopped at Impact Thrift Store in Montgomeryville. Jill, one of the managers, was so nice and gave us each a shopping tote with coupons! After stopping for a needed lunch break we went to one last shop at the ReStore in Chalfont. It was a long, hot day… but so much fun! And I came home with some great finds, too! A wicker stool and old, faded t-shirts. I have plans for both of them already. A large, wooden lazy Susan, an ash tray, an old cassette tape and these really cool gray and green vinyl tiles. Diane picked of a few of those tiles, too. And THE find of the day for me… Check it out! We all said we need to shop together more often, so hopefully there will be more group shopping trips down the road. Once a year is just not often enough! If you wanted to check out last year’s I Love Thrifting Trip, you can read my full recap of Philly I <3 Thrifting 2011 here.